If you would like to find out about the historic events in the oldest part of Barcelona don't miss out on this walking tour. It will reveal the most splendid period of the Catalan capital and its culture which can still be seen today. Every step of the tour is full of history, charm and magic. No tours on 1/1, 6/1, 25/12, and 26/12. Booking is really simple: just enter the number of persons you would like to book for, choose the desired date and click on "Add to cart"
A free cancellation is possible up to 48 hours prior to the event. You will receive a full refund. In case of a later cancellation or a no-show a refund won't be possible. If the tour is not feasable because of bad weather or for reasons that can't be influenced by us, we will give you a full refund. A cancellation will occur on site by the guide. During the two-hour walking tour you will see many sights of the old town of Barcelona. With the experienced local guide you will stroll through the narrow streets and will get an insight on how life changed in Barri Gòtic within the past centuries. The guide will explain every detail about the history of Barcelona from Roman times to the medieval period while you walk through its maze of streets and admire ancient buildings, museums, squares and small palaces. The Gothic Quarter has a charm all of its own with its narrow, cobbled streets, wrought-iron street lamps, buildings and delightful terraces that comprise hidden corners you can lose yourself in. 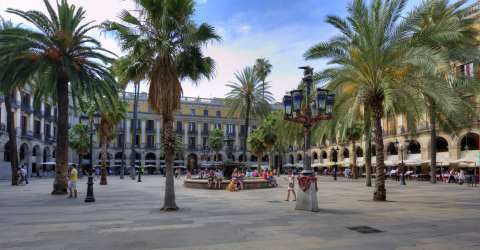 The tour begins at Plaça Sant Jaume or Plaça Reial, the seat of the local, autonomous government during the Middle Ages and at the present time. Next, you'll explore the narrow streets leading to Plaça del Rei, a unique site and the historic centre of power during the reign of the Catalan counts and monarchs. Beneath the square the remains of the Roman city of Barcino are laying with the impressive remains of the medieval city above it. To end the tour, close to the Plaça del Rei, you'll enter the imposing Barcelona Cathedral, built in different artistic styles throughout the centuries, next to the important surviving sections of the Roman walls. Please enter the number of people you would like to book for, choose the desired date and click on "Add to cart". There is no children rate. Please enter the desired time and date and chose the group size. Children up to 6 years don't count to the group size.